A rushed morning of preparations. Get cash from the hotel cambio, check out of the hotel, arrange to store a bag for the week and wonder if I’ll see it again, throw down a pancake and the same bad coffee as yesterday. Meet the rest of the tour. Danielle and Joanne have made it in from Mexico. They are from different parts of Australia, not traveling together. Margurite from the US via the Bahamas fills out our group. Jorge goes through the tour briefing for the sake of the newcomers. I’m distracted by the workers high up on scaffolding that takes up a significant part of the lobby, restoring the ceiling in broad swaths of “looks like wood” brown and ochre paint. The huge beams that straddle the ceiling at eight foot intervals are also being repainted with large poppy-like flowers in shades of oranges and golds. It’s not the Sistine Chapel but the amount of work it will take to complete the restoration is still impressive. We throw our bags in the back of the van that will be our home-on-the-road for the week and meet our driver. His name is Pedro but somehow I missed that. Distracted perhaps with the ceiling painters, as a result I spend at least a few days addressing him in something that sounds like Pierot, which is apparently Spanish for dog. I wonder why he is so unresponsive. Pedro drops us off for a walking tour of Old Havana. I’m pleased to be visiting my second UNESCO World Heritage site, the first being Luang Prabang, Laos last year. I think about making it my life’s mission to see all of the UNESCO sites before I die. Seeing the wooden cobblestones in Plaza des Armas and remnants of the ancient sewage system that once serviced the port of Havana, I realise how very important the UNESCO project is in preventing the world in it’s entirely from eventually looking all the same. I have certainly felt some urgency to see as much of the world as I can before all cities and towns have succumbed to the sameness of Wal-Mart and McDonald’s. 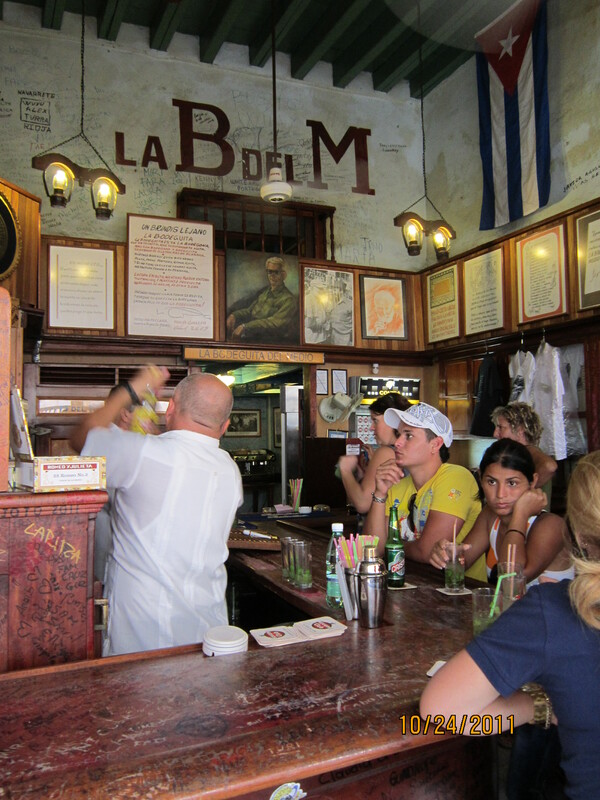 We stop for ”the best coffee in Havana” at a cafe in Plaza Vieja (Old Square) where I hear the deep throated song of a woman selling peanuts. The song is known as a pregon, or sellers cry and few vendors still use this enchanting and exotic method of broadcasting their wares. I buy a few straws of peanuts and she poses for a photo. Cuba’s recently introduced program of restoring major buildings is very evident in the large, open plaza and includes a beautiful new planetarium. The coffee is wonderful. Off Plaza de la Catedral we stop at the bar that allegedly invented the mojito so we we all drink a mojito and listen to great salsa music from the three piece band squeezed into the corner of the tiny, crowded bar. 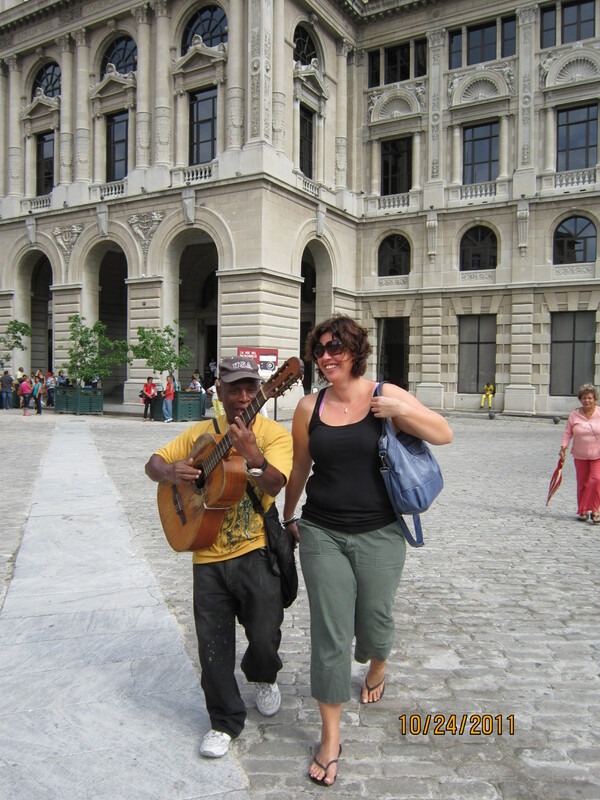 Music is everywhere in Old Havana. Along the way we lean into the open windows of a large restaurant to listen to a five piece band playing Buena Vista Social Club favourites. A couple of professional dancers are pulling patrons up to learn to salsa. We go into the Ambos Mundos Hotel, where Ernest Hemingway stayed in Room 511 in 1928 to write ”For Whom the Bell Tolls”. We take the ancient, wrought iron lift to the top of the hotel to a lovely restaurant where we all soaked in the gorgeous views from the rooftop and took photos. I resolve to come here for dinner on one of the extra nights at the end of the tour. On the way back to the van we pass the oldest standing structure in Havana, a temple with a large tree in the courtyard that Jorge says is a ‘cotton silk’ tree. 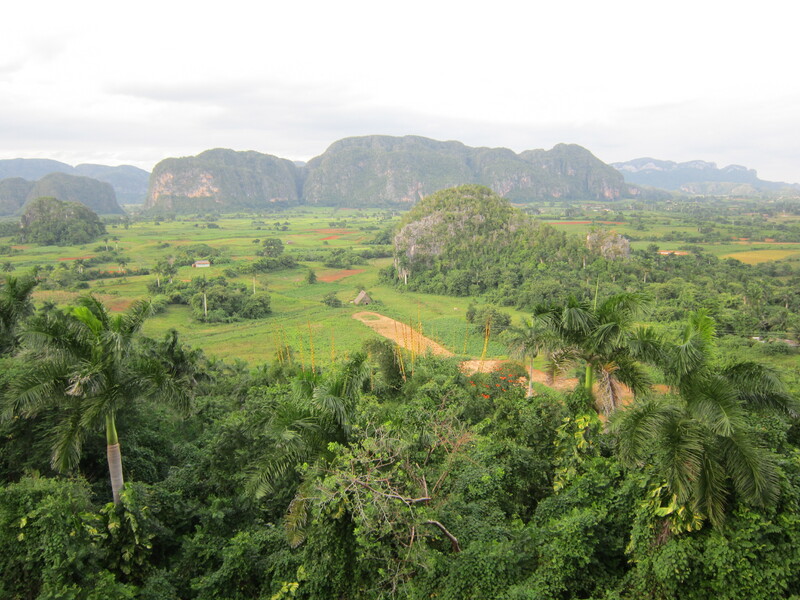 We settle into the van for a few hours drive to the Vinales Valley , another UNESCO World Heritage site. An hour or so into the drive we stop at a state-run cafe at the side of the road. They have three kinds of sandwiches – ham, cheese, or ham and cheese. We eat ham and cheese on hamburger buns, barely toasted and I have a Cristal beer. After our quick lunch we are on our way to the next stop – an orchid garden. We see the large display of orchids in a sheltered nursery, some endemic only to Cuba and then walk the winding stone paths through beautifully landscaped gardens. Our garden tour guide points out the plants along the way, including the delicate and reclusive mimosa that closes it’s feathery leaves at the lightest touch. Very cool. The groundskeepers house at the top of the garden walk is particularly quaint and lovely – a place I could see myself spending some time with it’s sunny patio and charming bridge between moss covered boulders. We make a quick banos stop at the restaurant at the foot of the gardens and are on our way. Approaching Vinales we stop at a viewpoint that looks over the entire valley. Gorgeous views of the lush farmland, interrupted sporadically by mountainous, high rock outcroppings that remind me of the giant karsts rising from the seas around Krabi in southern Thailand. Sure enough, Jorge points out that only one other place in the world has these ”mogotes” (pin cushions) and that’s in the Indo China Sea. Vinales is a small agricultural village of about 10,000 people. The primary mode of transportation seems to be the small wooden dog carts, pulled by a single, small and thin horse that we’ve seen occasionally along the road on our drive in. There are some cars, some bicycles and occassionally a string of large bulls or oxen (?) being driven along the street by their driver or hauling very large wooden farm wagons. We are checked into our first home stay casas. Margurite and I have single rooms in the home of Maga and Julian, while the four others are sharing double rooms in the casa next door. 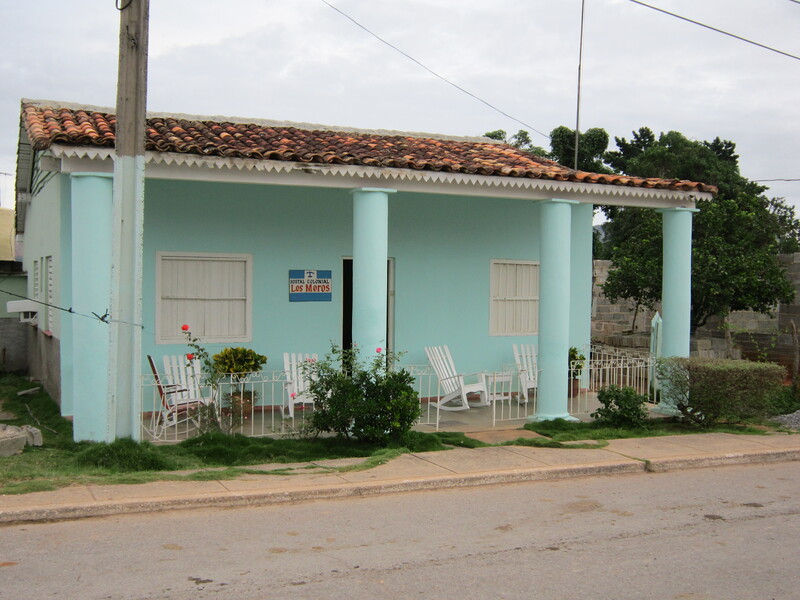 The casas are small and sparsely furnished but are clean and comfortable. They are also very close to each other as we can hear the girls next door getting settled into their rooms. Jorge gives us a tour of the town – one cobbled main street with state-owned shops, a few cafes and, of course a large central square where it apparently all happens. The large church Roman Catholic and the only nightclub in town compete for souls at opposite ends of the plaza. We dine with our hosts on this night – delicious roast chicken, boiled yuca, sliced cucumber and green tomatoes, and a plate of fresh fruit for dessert. 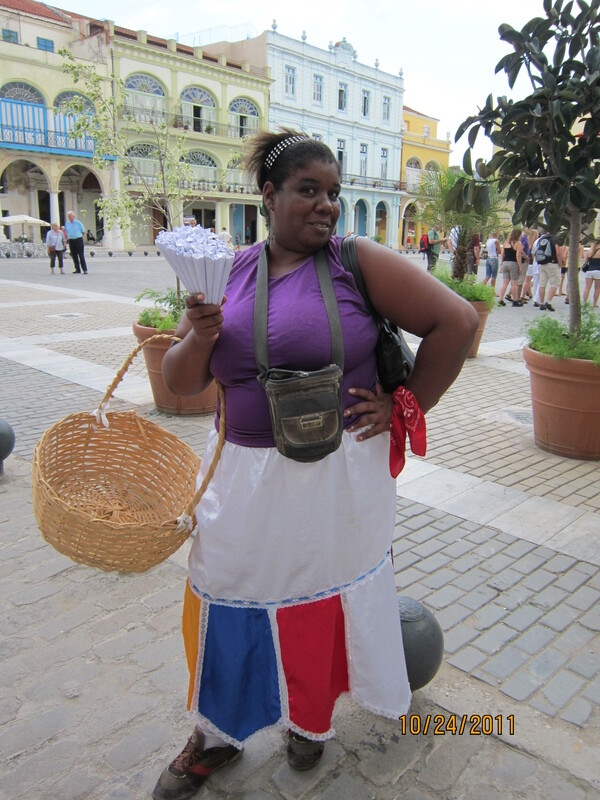 Cuba prides itself on fruits and vegetables being ‘organic’ – grown with minimal pesticides – and it is all tasty but very limited in variety as there are virtually no food imports but I would develop an aversion to ham and cheese before our tour is over. I’m very glad Margurite and I are together as our hosts speak only a few words of English, and with our few words of Spanish the table conversation is a bit of a challenge. Between the two of us we manage to communicate where we are from and a little bit about ourselves and we are able to learn that Maga and Julian have three boys who eat a lot and are very busy with school and sports. excellent quality writing, it is rare too see a nice blog like this onne nowadays.